This content has 6 years, so all link after 30 days & DMCA is broken link & NO REUPLOAD. The theme of the film is the love between parents and children. The story covers 13 years and begins with a 19-year-old college student named Hana who encounters and falls in “fairy tale-like” love with a “wolf man.” After marrying the wolf man, Hana gives birth and raises two wolf children—an older sister named Yuki who was born on a snowy day, and a younger brother named Ame who was born on a rainy day. 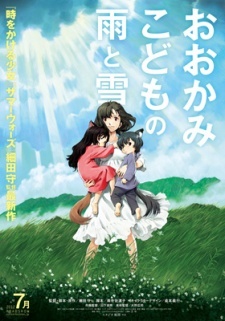 The four quietly lived in a corner of a city to conceal the existence of the “wolf children,” but when the wolf man suddenly dies, Hana decides to move to a rural town far removed from the city.